The Cambridge Scottish Festival is a festival dedicated to preserving Scottish heritage and traditions since 1975. The festival hosts a modern version of the Highland Games, which were originally intended many years ago to keep men in good physical condition in case of war. Events at the Cambridge Scottish Festival include competitions in traditional arts, such a piping and dancing, along with athletic events. The athletic events include the caber toss, the hammer throw, and the tug of war. The festival also includes the display of antique cars with the help of the Historical Automobile Society of Canada. There are also activities for the kids, including a bouncy castle and Highland cows to entertain them. The pipe band competition features over 25 pipe bands, many of them youth bands. There are also over 250 dancers that compete at the event. The festival also includes genealogy by Christine Woodcock. Her mother was one of 21 children, but she managed to compile a list of her grandfather’s 349 descendants. Born in Scotland and raised in Canada, she remains immersed in Scottish culture, leading her to be a part of the festival. The Cambridge Scottish Festival features a beer garden, and food is available from various vendors including traditional Scottish fare. There are over 40 vendors at the festival, as well as live entertainment with Tom Keefer, a musician dedicated to his Scottish and Irish heritage and the preservation of traditions and music. Other past artists have included Steel City Rovers and Stringymajig. 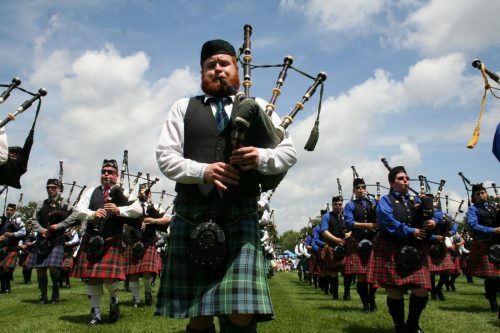 Originally known as the Highland Games, the change to the name Cambridge Scottish Festival was made in 2016 as the result of the ongoing success of the event. The goal of the change was to better promote Scottish contributions to Canada and the community in which the festival is held. Christmas in the Village is an annual event in late November in Belmont Village featuring attractions for children and adults. Admission to Christmas in the Village is free, though there is a cost to participate in some of the festival's features.